The Valencia Fountain is a beautiful fountain to add to your garden or patio. A tall wall fountain, the Valencia Fountain features a flower pattern in the center of the top piece. Within the flower is a copper tube from which the water flows into the basin below. Once the water fills the basin, it overflows four points and into the large main basin. The Valencia Fountain is made of cast stone and will develop an attractive antiqued look that is enchanting and reminiscent of established gardens. The Valencia Fountain is part of the Campania cast-stone collection and is not sealed, allowing it to develop a natural patina over time. The Moderne Wall Fountain is shown in Pietra Nuova (PV) patina. The Valencia Fountain is 62.5 inches tall, 29 inches wide, and 17.5 inches front to back. It weighs 747 pounds. Pump included and installation instructions. All Campania International pieces are stained to order. This process takes 10-14 business days to complete and to prepare for safe shipment. 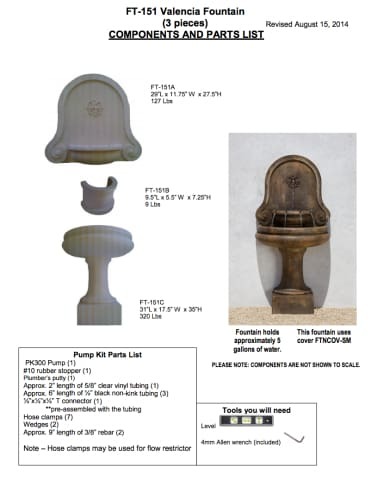 Order the Campania International Valencia Fountain with free curbside delivery to your home from TheGardenGates.com today.